We have just started our 30 Day Yoga Challenge! What does this mean? It means that for the month of April (and a little bit beyond for those of you who start a little late) we are encouraging you to commit to a daily practice. There are two tiers: The 20-day goal and the 30- day goal with corresponding prizes! The benefits of a daily practice cannot be described enough. Giving yourself the time to be present, come to your mat, and breathe translates into less anxiety, increased productivity, and a host of other advantages. There are also the physical benefits of more strength, flexibility, and body awareness. YOU CAN DO IT! IT’S FOR EVERYONE AND EVERY LEVEL. If you are a once-a-week practitioner, this might feel like a huge leap, but you can do it! so you need to pace yourself. Doing yoga everyday does not mean you should hurt yourself! Try taking classes you have never done before to achieve a balanced practice. Go to Power Yoga and then the next day try Stretch and Refresh. Stretch and Refresh is designed for athletes and people who sit at a desk to release and loosen the muscles. We also offer Slow Flow which allows you to move more deliberately and Restorative which is a gentle class designed to help you unwind for a stressful week. and harder to make and meet new friends outside of work. There is nothing like the friends you make at your local yoga studio. When you start doing your challenge, you will meet the regular faces and members of your Old Town Yoga Community! They will keep you accountable for showing up. They will know when you’re not feeling well and when you’ve had a great day! We offer a chance to track your progress on our poster board. If you don’t want to go public with your goals, no worries! You can register for free online and no one can see it but you and us. You’ll get daily reminders in your inbox to help you schedule which class you want to take. 15% off of your next class package or Refresh purchase (does not include massage, auto renews, or yearly membership). Auto-renew members receive a $10 account credit. 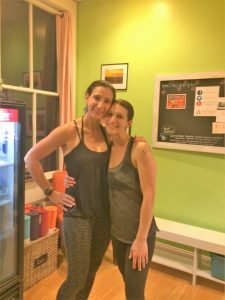 3 Free Classes to friends who are new to Refresh! Even if you don’t reach 20, you should still feel accomplished. Is April not your month? 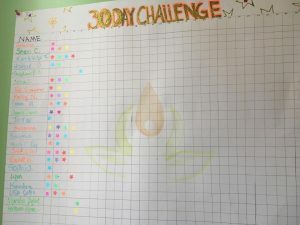 Pick your start date and do your own challenge!